So far Stop Illegitimate Vetoes has created 28 blog entries. The vetoes of 2018: Indications for optimism? Three illegitimate vetoes have been cast in the Security Council in 2018, all of these have regarded the Middle East, and have undermined the effectiveness of the Council in its own way. On 26 February 2018, the draft resolution on the Yemen sanctions regime (S/2018/156) was vetoed by the Russian Federation. The 10 April 2018, a resolution (S/2018/321) was proposed to launch an independent investigation on chemical weapons usage in Syria. This was vetoed, again, by the Russian Federation and is remembered as the sixth resolution of this kind which has been blocked by Russia. Finally, on the 1 June 2018, a resolution was proposed to function as unitary statements by the Security council on the Israeli-Palestinian conflict (S/2018/516). This resolution was blocked by the USA. The year marks a clear decrease in the number of vetoes cast, compared to last year. Although, one should take note that 2017 had a larger amount (6) than the prior 2000s as a whole and with this in mind, the number of vetoes have not decreased dramatically in the longer period. One should remember that the current situation in the UNSC has not been ignored by the General Assembly. Assembly President María Fernanda Espinosa Garcés (Ecuador), stated in November this year, that “the Council must adapt to new political realities, with increased representation boosting its legitimacy and the implementation of its decisions”. This was backed up by the representative of Sierra Leone, which speaks on behalf of the African Group that “most issues discussed in the 15‑member organ are related to this continent. Its 54 nations must be involved in decisions concerning not only international peace and security, but its own very continent” . Africa demands no more, and no less than two permanent seats in the UNSC, which includes the veto power. Some members of the assembly called for the abolishment of the veto power in the UNSC. The call for regulation of the veto power is not something new for the UNSC, nor the General Assembly. But, whether or not these calls for change will translate into actual regulations‒only 2019 can tell. Syria constituted, last week, a source of great friction in the Security Council. Russia cast its veto on a resolution regarding action against Syria’s leader al-Assad following use of chemical weapons by the regime. Last week, the UN Security Council once again met to vote on a resolution dealing with the civil war in Syria. The situation changed last week with yet another attack with chemical weapons by the Syrian regime against its population. Even American president Trump changed his administration’s stance on Syria’s al-Assad following the attack, from being unwilling to intervene in the conflict, to launching 59 Tomahawk cruise missiles at an army airfield outside Damascus. The resolution put forward by the United States, the United Kingdom and France based on observations of OPCW (Organization for Prohibition of Chemical Weapons), was to punish al-Assad for breaching the resolution 2118 (from 2013) where al-Assad were to destroy all his stockpiles of chemical weapons. However, the resolution did not pass this time either. The Russian envoy to the UN argued that the resolution “failed to serve any useful purpose.” This decision attracted criticism from fellow UN members such as Ukraine. 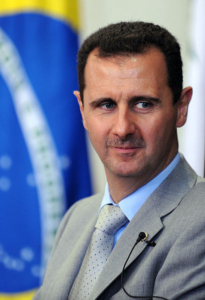 This is the eighth time Russia has cast its veto to protect Syria’s leader al-Assad from UN action. The use of the veto and Russia’s desire to keep al-Assad in his place has paralyzed the UN from acting, and constitutes a tragedy for the Syrian people. Syrian President Bashar al-Assad has allegedly, for the first time, been personally linked to the use of banned chemical weapons in the Syrian conflict. Despite this, Security Council member states have opted to not put forward a draft resolution on imposing sanctions due to expectations of a Russian veto. The Joint Investigative Mechanism, a joint inquiry for the United Nations and the Organization for the Prohibition of Chemical Weapons mandated by the Security Council to identify individuals and organizations responsible for chemical attacks in Syria, has identified Syrian President Bashar al-Assad and his brother as linked to chemical attacks, Reuters reported in mid-January. This has raised the question of imposing sanctions on al-Assad and other high-ranking individuals connected to chemical attacks. Already in December, the United Kingdom and France drafted a resolution to impose sanctions on key individuals, but the draft resolution was never put to a vote, as it was expected that Russia would veto any attempt to hold the Syrian regime accountable. Those expectations do not seem to have changed. In the final days of the Obama administration, the United States pushed for the UK and France to put the draft resolution to a vote, but with no success. 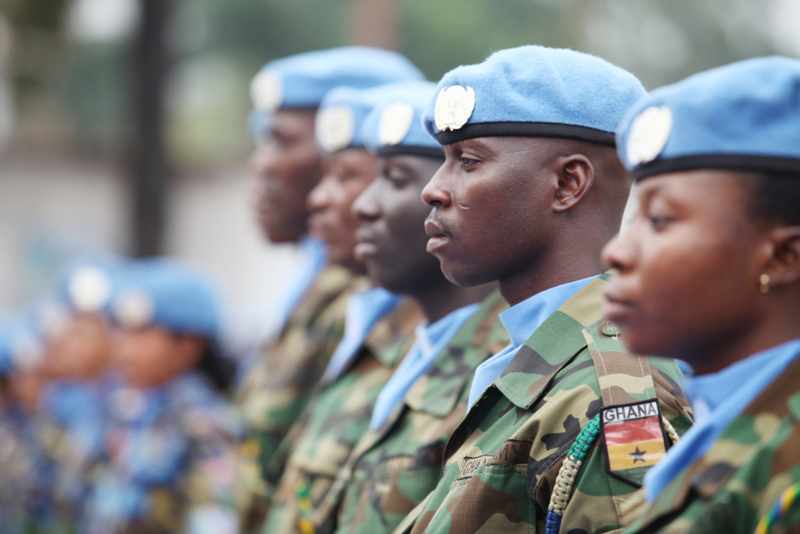 According to Security Council diplomats, the reluctance to introduce the draft resolution is due to issues of timing. There is fear that if the draft resolution was introduced and vetoed as expected, it could reverse the fragile positive trend that has allowed two resolutions to be unanimously adopted and peace talks in Astana to be arranged. Additionally, it is believed a vetoed resolution could essentially kill any chance of holding Syrian authorities accountable in the future. There is also uncertainty related to the change of administrations in the United States; it is still unknown how the Trump presidency may change council dynamics on the issue. As a result of the lack of council action, the United States decided to move ahead with unilateral sanctions targeting 18 Syrian government officials. Those targets include several intelligence chiefs linked to the regime’s use of chlorine gas on civilians in 2014 and 2015. 2016 has drawn to a close. It has been an eventful year in international affairs, to say the least. Stop Illegitimate Vetoes looks back at the year in the Security Council and some of the veto-related issues of the past twelve months. 2016 started with an announcement from North Korea that the country had successfully detonated a hydrogen bomb in an underground test site. The announcement was soon followed by a ballistic missile test, which constituted a breach of previous Security Council resolutions. The actions caused the Security Council to impose sanctions on the already isolated country. This is despite the fact that China, its only ally, is a veto-wielding state. It seems China has run out of patience with its smaller neighbour, and subsequent tests have resulted in heavier sanctions and unanimous condemnations from the Security Council. China’s decision not to shield its ally may have been somewhat surprising, but it was nothing compared to a similar decision by the United States. On the 23rd of December, the Security Council adopted a resolution stating that Israeli settlements on occupied Palestinian territory constitute a violation of international law and pose an obstacle to a two-state solution and lasting peace. The United States, which traditionally has used its veto to block resolutions condemning Israeli actions, abstained from voting, allowing the resolution to be adopted – drawing heavy criticism from Israelis and Americans alike. The abstention came after months of speculation that Barack Obama would allow a resolution addressing the situation to pass before leaving office in mid-January. 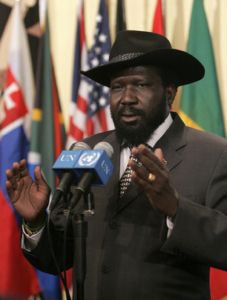 South Sudan has also figured in the Security Council’s dealings. During the year there has been talk about an arms embargo to limit the prevalence of arms in the countries, amidst fears of an impending genocide. Both Russia and China had expressed scepticism of such a measure. But, as a draft resolution was voted on in December, both chose to abstain rather than to veto against it. Despite this, the resolution was not adopted as it did not receive enough votes in favour. The main veto-related situation of the year was, of course, Syria. All three vetoes that were cast in 2016 blocked draft resolutions addressing Syria. On the 8th of October, Russia vetoed a resolution calling for a cessation of hostilities and the establishment of a no-fly zone over the city of Aleppo, as well as unhindered access for humanitarian aid and that perpetrators of atrocities be held accountable. This was the first Russian veto on a draft resolution on Syria that was not joined by a Chinese veto, as China instead abstained from voting. Two months later, however, things were back to normal as China joined Russia in vetoing another draft resolution calling for an immediate ceasefire. The two Russian vetoes mean that Russia has surpassed the United States as the most frequent user of the veto since 1991. 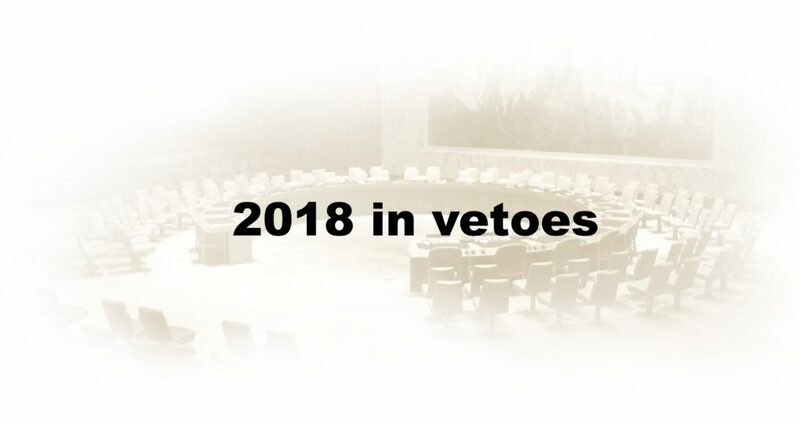 Read more about how the veto has been used since 1991 in Stop Illegitimate Vetoes’ report “Legitimate Concerns”, which has been updated to include the most recent vetoes. The deadlock in the Security Council over Syria led to increased criticism of the council and the veto. Stephen O’Brien, the humanitarian chief of the United Nations, was one of the most vocal critics, calling Syria “our generation’s shame”. The deadlock also increased calls for alternative ways to address the situation, without involving the Security Council. More than 200 civil society organizations signed an appeal calling on the General Assembly to act in accordance with the 1950’s “Uniting for Peace” mechanism. There also seems to be some support for such a course of action amongst member states as well: in October, Canada gained the support by over 60 states to convene an informal meeting on the situation in Syria, a way to gauge the support for going ahead with “Uniting for Peace”. In December, there were allegedly over 70 states supporting such a move. 2016 has also seen increased support for the French Initiative and the ACT-group’s Code of Conduct, aiming to restrain the use of the veto, with almost 120 member states now supporting at least one of the two initiatives. Last, but not least, Antonio Guterres was elected as the new Secretary-General of the United Nations. The process in which he was elected has been hailed as historically transparent, with public hearings of candidates and more attention paid to their visions and agendas for the coming years. Still, the decision was the Security Council’s to be made, and the customary secret ballots were held to see if there was a candidate with enough support from Council members. In the end, Antonio Guterres emerged as the clear favourite, and when it was evident that there would be no veto against him, he was quickly nominated by the Security Council and confirmed by the General Assembly. Guterres has a tough time ahead of him, as does the United Nations at large. Turning to 2017, there will be plenty of issues around the world to be dealt with, and the veto will surely remain an obstacle. Syria will continue to be the single most pressing issue for the Security Council, which is still divided over how to handle the situation. North Korea seems to enjoy its time in the spotlight, as it started off 2017 in much the same way as they did 2016 – with nuclear sabre rattling. How far China is ready to go in order to contain its unruly neighbour remains to be seen. Developing crises and humanitarian catastrophes in countries such as the Democratic Republic of the Congo, Burundi and Yemen are increasingly demanding the Security Council’s attention, and it is not yet clear whether the Security Council can face these issues united, or if tensions and divisions will continue to obstruct the body’s work. As Donald Trump takes over as President of the United States, we are unlikely to see more action relating to Israel and Palestine; Trump was very critical of the United States’ recent abstention, and during his campaign he vowed to veto any draft resolution addressing the situation. Trump’s presidency may also cause a larger upset of council dynamics, as he has advocated for closer ties between the U.S. and Russia and for more ruthless action in Syria. He has questioned the value of the United Nations, and has shown disregard for its humanitarian and legal underpinnings. 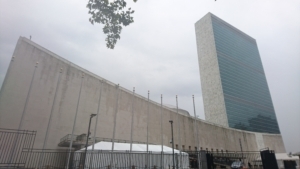 This may strain the relation between the “P3” – The United States, the United Kingdom, and France – and shift alignments in the Security Council. The coming French elections, which may bring Marine Le Pen to power, brings further uncertainty, not least with respect to the future of the French initiative on veto reform. In 2017, the world will need to intensify the demands for veto reform. Join us in taking action against the use of the veto in the Security Council. If you want to contribute to VetoWatch, or engage with the Stop Illegitimate Vetoes campaign in some other way, do not hesitate to contact us at contact@stopillegitimatevetoes.org. The United Nations Security Council was able to adopt a resolution emphasizing that Israeli settlements on Palestinian territory have no legal validity. The resolution was adopted as the United States abstained rather than use its veto, as it has frequently done in the past. On Friday the 23rd of December, the Security Council adopted a resolution stating that Israeli settlements on occupied Palestinian territory constitute a violation of international law and pose an obstacle to a two-state solution and lasting peace. The resolution demands that Israel cease all settlement activities in the territory, including East Jerusalem, and stresses that these activities are a threat to the two-state solution. The resolution also calls for intensified diplomatic efforts to achieve a lasting peace in the region. The resolution was adopted with 14 votes in favor. The United States, who has frequently vetoed draft resolutions addressing the situation, abstained from voting, allowing the resolution to be adopted. The most recent veto from the United States was in 2011, on a draft resolution bearing some similarities to the one passed on the 23rd, and it has long been suspected that President Obama would allow a resolution addressing the Israeli settlements, of which he has been critical, to pass before the inauguration of Donald Trump on the 20th of January. Donald Trump has been critical of the resolution. 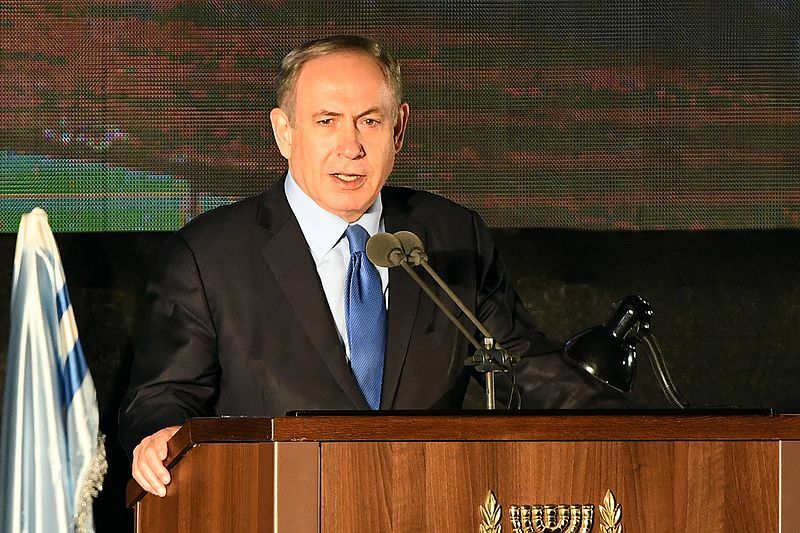 Israeli Prime Minister Benjamin Netanyahu called the decision “shameful”, and has instructed the Foreign Ministry to re-assess the country’s ties with the United Nations. Already, the country has cancelled funding for five U.N. institutions it deems “especially hostile” to Israel. The resolution was initially presented to the Security Council by Egypt, but was withdrawn before the vote after Israel had asked Donald Trump to intervene as it feared the United States would abstain. The resolution was re-introduced by Malaysia, New Zealand, Senegal, and Venezuela. After two draft resolutions addressing the situation in the Syrian city of Aleppo have failed to be adopted this autumn due to Russian and Chinese vetoes, the Security Council has finally agreed on a resolution to send observers to the city to monitor the evacuation of civilians. Monday the 19th of December, the Security Council unanimously voted for a draft resolution that would deploy UN observers to monitor the evacuation of civilians from Aleppo. The resolution is the result of three hours of private discussions, after France circulated a draft resolution suggesting UN observers on Friday, that Russia threatened to veto. Russia proceeded to table its own draft resolution, which allegedly did not mention observers specifically but called for arrangements to monitor the condition of civilians remaining in Aleppo. The adopted resolution reportedly asks the Secretary-General “to take urgent steps to make arrangements, including security arrangements in consultation with interested parties, to allow the observation by the UN and other relevant institutions of the well-being of civilians… inside the eastern districts of Aleppo”. It also called for “adequate, neutral monitoring and direct observation on evacuations from eastern Aleppo and other districts of the city”. Evacuations from Aleppo started on Thursday under a deal that allows Syrian government forces to take full control over the city, the eastern parts of which has long been controlled by rebel groups. Disagreements caused the evacuations to stall on Friday, and on Sunday some of the buses meant to carry out the evacuation were attacked and set on fire. Operations resumed on Monday, with 5 000 people leaving Aleppo in 75 buses. “It is becoming clearer every day that the UN Security Council has failed the Syrian people.” Those are the words of Sherine Tadros, Head of Amnesty International’s UN Office, as the organization appeals to the member states of the United Nations to call an Emergency Special Session of the General Assembly to do what the Security Council cannot. Besides Amnesty, 222 other civil society organizations have signed the appeal. The appeal calls on member states to “demand and end to all unlawful attacks in Aleppo and elsewhere in Syria, and immediate and unhindered humanitarian access so that life-saving aid can reach all those in need.” The appeal also highlights the need for accountability, and that those committing serious crimes against international law are brought to justice. Reportedly, a draft resolution on a 10-day truce in Aleppo is being circulated in the Security Council. It remains to be seen if Russia, who last vetoed a resolution calling for an end to aerial bombardments and an investigation into alleged war crimes in early October, will let such a resolution pass. For the sake of the Syrian people it should – but it may be too little too late as, hundreds of thousands of people have already suffered the fatal consequences of war. While the United States has reversed its previous skepticism about an arms embargo on South Sudan and circulated a draft resolution, Russia and China are still expressing doubt over such a move. Last week, the United States circulated a draft resolution imposing an arms embargo on South Sudan in an effort to limit the spread of weapons and lower the risk of genocide in the country. The circulated draft resolution also suggested additional targeted sanctions, in addition to the six generals from both sides of the conflict already subject to asset freezes and travel bans. The draft resolution does not seem to have convinced other key members of the Security Council. On Friday, the Security Council issued a statement condemning attacks against civilians and urging the parties to pursue a political process to end the violence. No resolution on further sanctions or an arms embargo were put forward for a vote, although the statement did note that the Council may take additional measures in order to prevent further escalation of violence and conflict if the situation does not improve. Such measures could include targeted sanctions. Russia and China have long been skeptical over imposing an arms embargo, arguing that weapons are already widespread in the country and an embargo would do little to change the situation. Petr Iliichev, Russia’s deputy ambassador to the United Nations, stated that an arms embargo “would hardly be helpful in settling the conflict,” and that “introducing targeted sanctions against South Sudanese leaders would be the height of irresponsibility now.” Both Russia and China holds a veto at the Security Council, and an arms embargo or sanctions cannot be imposed if they vote against it. The statement and draft resolution comes after the Council was briefed last week by the Special Advisor on the Prevention of Genocide, Adama Dieng, and the Special Representative of the Secretary-General for South Sudan, Ellen Løj. The situation in the country has escalated in the past months, as a peace agreement from last year has failed to end the violence, which is largely taking on ethnic lines, sparking fears of an imminent genocide in the country.